Mannheim, 8 May 2018 – As part of the SAE 2018 World Congress in Detroit, Michigan, Andreas Schmitt, Team Leader Aerodynamics, Röchling Automotive, and his Canadian co-authors from the National Research Council (NRC)/Transport Canada received the Arch T. Colwell Merit Award on 10 April 2018. In a solemn ceremony, they received the prize for outstanding publications in the field of transport for their SAE paper dealing with assessing the efficiency of various technologies designed to reduce aerodynamic drag. In the course of the wind tunnel study described in it, systems such as the intelligent, controllable Active Grille Shutters (AGS) from Röchling Automotive were tested. “We are happy to receive this prestigious award, for it rewards the aerodynamic potential of our systems and the passion of Andreas Schmitt and his team members,” says Erwin Doll, President and CEO, Röchling Automotive. “I am proud to accept the award. The measurements performed on more than 30 vehicles gave us a unique abundance of insights into the efficiency of our product portfolio. I would like to sincerely thank my colleagues for their active support in vehicle preparation on site,” adds Andreas Schmitt, Team Leader Aerodynamics, Röchling Automotive. The three-year study examined various aerodynamics solutions in the 9 x 9m wind tunnel of the NRC in Ottawa in Canada. The activities included integrating the AGS from Röchling Automotive into several vehicle systems and testing it under changing conditions. In addition, other technologies for reducing aerodynamic drag were used in the study too. The results were as follows: of the tried and tested technologies available on the market, the Active Grille Shutter, which covers the whole radiator, allows the greatest reduction in aerodynamic drag. Also, the tests performed proved the potential of other Röchling aerodynamics solutions such as the active air dam. This innovative technology shades the rugged structures on the bottom of the car, thus helping to reduce the aerodynamic drag. In addition, Röchling Automotive regularly performs tests and simulations in order to constantly optimize its technologies. At present, for example, a simulation of driving through water is being developed. For more information on Röchling Automotive and other aerodynamics solutions such as Active Speed Lips - which direct the air around the tires and reduce turbulence - or on the Integrated Sandwich Floor concept, please go to https://www.roechling.com/automotive/products/aerodynamics/. 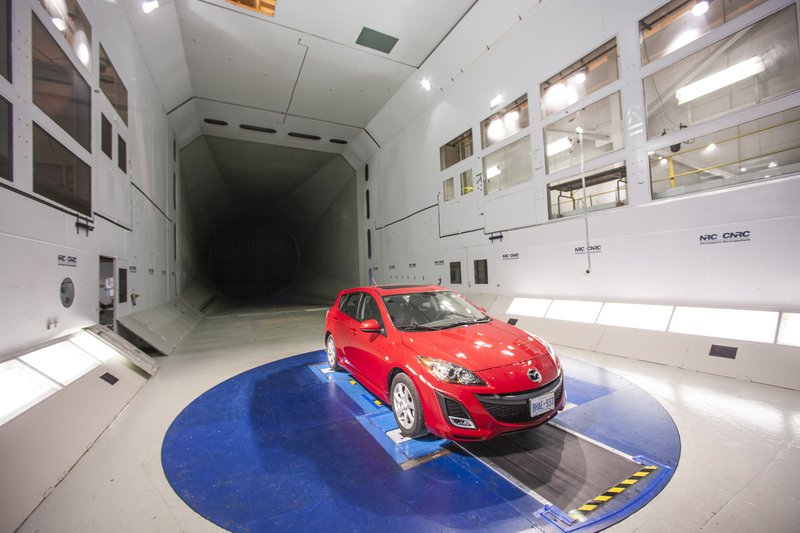 © National Research Council, Ottawa; oconnor – fotolia.com; Roechling Vehicles equipped with technologies from Röchling Automotive performed exceptionally well during the wind tunnel study.